Great Gable is one of the most popular of the Lakeland fells, and is an impressive object from whatever direction it is seen. I'm most familiar with the view from Wasdale, where the south-west ridge makes the fell looks like a shapely pyramid or from the head of Ennerdale, where it sits alongside Green Gable. From this (and most angles) Great Gables looks like a massive dome, and this is a more realistic impression of the fell. Great Gable is almost square, with four corner ridges and four distinct faces, each with their own character. The southern face has the most interesting rock features. Napes Needle is the most famous, but is also surprisingly small and difficult to locate from most angles. Below the line of crags is a large scree slope, crossed by a rather dull tourist path heading to Sty Head. The main line of crags includes White Napes to the west and Great Napes in the centre, with the gaps of Little Hell Gate and Great Hell Gate on either side of Great Napes. A climbers path runs along the base of the crags. The north face is dominated by Gable Crag, which looms over the head of Ennerdale, and over Moses' Trod. The east face is the least impressive, sloping fairly gently down towards Styhead Tarn. The west face is quite simple in form, with the same screes as the south face, but lacking the interesting crags. Its smooth face helps create the pyramid-like appearance of the fell when seen from Wasdale Head, along with the sharp south-west ridge. Great Gable was one of the birth places of British mountaineering. Napes Needle was first climbed in 1886 by Walter Haskett Smith, the father of rock climbing. This was in the period in which rock climbing first became a sport in its own right. Great Gable can be approached along all four corners (although the south-west corner is for scramblers and climbers rather than walkers). The easier approach is up the long south-east ridge, which runs down to Sty Head. This is the longest but most gentle path, with no terrors. The north-west ridge looks almost impossible from most angles, but in good weather is actually quite straightforward. An easy ridge leads to the base of a boulder field that takes you most of the way to the summit. The north-east ridge comes up from Windy Gap along a path that isn't as bad as it looks. The route you take will depend on your starting point. From Wasdale the south-east and north-west ridges are the best options. From Honister Moses' Trod brings you to either Green Gable and the north-east ridge or to the north-west ridge. From Borrowdale you can either head to Sty Head and then go up the south-east ridge or Aaron Slack and the north-east route, or come up Sour Milk Gill and Green Gable. From Ennerdale the fell is normally climbed by visitors to Black Sail YH, using either the north-west or north-east ridges. It is also sometimes visited on the Ennerdale Horseshoe, generally coming from Green Gable and continuing on to Kirk Fell. We have one ascent of Great Gable, heading up the north-west ridge and down the south-east ridge, starting from Wasdale. The top of the fell is a rocky plateau, surmounted by the famous war memorial to the members of the Fell & Rock Climbing Club who died during the First World War. The best views of Wasdale are to be found from the area of Westmorland Cairn at the south-west corner of the summit area. 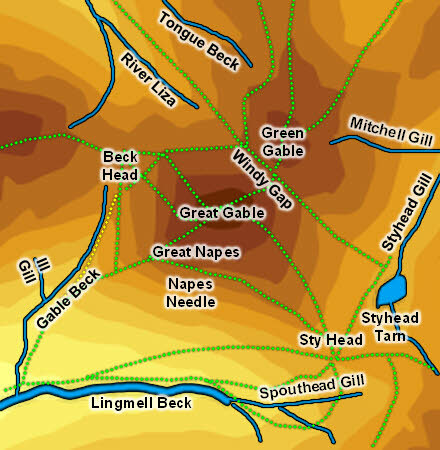 Most of Great Gable's slopes are dry, but the boundaries are all marked by water. To the north east the River Liza flows north-west into Ennerdale while a beck flows down Aeron Slack towards Styhead tarn. In the south Spouthead Gill flows own from Sty Head, joining Lingmell Beck to flow across the foot of the southern slopes. To the west Gable Beck flows down the valley between Great Gable and Kirk Fell, joining Lingmell Beck. Finally an unnamed beck flows north from Beck Head to join the Liza. Because of these streams Great Gable covers a fairly small area on the ground, but that doesn't stop it dominated in the air. Great Gable shares Styhead Tarn, one of my favourites, sitting as it does in a splendid bowl below impressive crags, with a distant view down towards Borrowdale. To the west Beckhead Tarn is shared with Kirk Fell, although it doesn't always contain water. The only fell to belong entirely to Great Gable is Dry Tarn, on the south-eastern ridge, but as the name suggests this is also often dry. Moses' Trod runs along the northern and western slopes of the fell on its way from the Honister quarries to Wasdale and beyond that Ravenglass and the sea. The route was originally designed for pack horses which would bring slate from the quarries along a fairly level route all the way into Wasdale. Its name comes from Moses Rigg, a quarryman who was reputed to be a smuggler, exporting whisky. The route went out of commercial use in the 1850s, but has survived as an excellent walker's route, especially good for people heading for Great Gable from the top of Honister Pass. Moses was also associated with a small hut that once stood high in Gable Crag, and was once the highest building in England. The hut is now in ruins. On the side of one of the many boulders at the summit is the Fell and Rock Climbing Club war memorial for the First World War. A Remembrance Day service is held on the summit of Great Gable each year and is always well attended, despite the weather. Westmorland Cairn, which offers the best view of Wasdale Head, is located to the south-west of the summit. The cairn was erected by two brothers named Westmorland in 1876 and has nothing to do with the county of that name. Personally I find Wasdale Head a little diminished from this lofty perch, and prefer the view from the slopes of Kirk Fell.